Marc Ramser is a specialist for sonorous and beautifully designed hammered dulcimers. 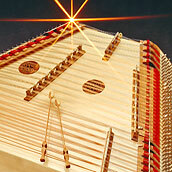 The range of products includes: hammered dulcimer, bass hammered dulcimer, santoor, sound bed and polychord. The internationally renowned Marc Ramser has been making and playing hammered dulcimers for many years. Thanks to his musical experience, he has developed the hammered dulcimer to meet modern demands. The systematic-chromatic tone arrangement, the muting system and the electronic sound pickup have all convinced discerning musicians. The products available at SaitenArt include instruments for musicians, musical therapists, students and friends of the hammered dulcimer. Being a small business, SaitenArt is able to cater to individual tastes. Besides the models described on these pages, Marc Ramser has a long and broad experience with customized products and looks forward to your questions. Well-known musicians from the international hammered dulcimer scene play instruments from SaitenArt.